Sacred Sounds for Vibrational Healing and EnlightenmentTibetan Singing bowls are used worldwide for meditation, music, relaxation, and personal well-being. They are used by a wide range of professionals, including health professionals, school teachers, musicians and spiritual teachers. Singing bowls are used in health care by sound healers, psychotherapists, massage therapists, cancer specialists, stress and meditation specialists. They are used to help treat cancer patients and also for post traumatic stress disorder. Singing Bowls are also popular in classrooms to help facilitate group activities and focus students' attention. Playing and experiencing Tibetan Singing Bowls can reduce stress and pain, balance energy, create vitality, synchronization and spontaneous healing, and effectively alter consciousness into a peaceful and expansive meditative state. Bindi uses three types of bowls in her performances and sessions; Bhutanese, Nepalese and Tibetan. The Bhutanese bowls were created specifically for the purposes of healing with the secondary effect being altered consciousness, and Tibetan bowls created mainly for altering consciousness. The final result of both is the same - healing and transformation. Himalayan or Tibetan Singing bowls have been traced to the shamanistic Bon tradition which predates Buddhism by thousands of years. Dr. Gaynor mentions in an article in Shamans Drum magazine that the reason sound (and chanting) are still used in shamanistic cultures is that the sound induces trance states of consciousness conducive to healing. 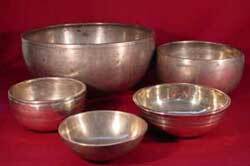 The ancient Himalayan Bowls are made from a consecrated seven metal alloy which, when skillfully stimulated, produce five individual and simultaneous tones, each at its own consistent frequency, which vibrational-ly dance with each other. The raw materials were collected, smelted and purified, cast, reheated and hammered into shape and tone. Mantras or sacred chants were sung and infused intent into the bowls. Their sound synchronizes sentient brain waves and creates a therapeutic effect upon the mind/body realization. Singing Bowls, produce the primordial sound of ‘AUM’: The fundamental utterance of energy metamorphosing into matter. They alter space, mind and time; awakening cellular memory and healing the energy body. The act of listening to their captivating overtones effectively stops one's internal dialog, the ‘Monkey Mind’. The individual is transported into a space of tranquility and balance where the ‘Universal Chord’, found within each self, is touched, joined with and understood. The Universal Chord is the primordial substance from which our whole reality is made and from which our Universe originated. Although the vibrational energy of the bowls can be directed to a specific area for healing purposes, they work effectively on a more fundamental level to increase overall well-being. You may contact Bindi at 239826-7119 or send email.